The latest collaboration between memory manufacturer Apacer and gaming laptop maker CLEVO results in a synergy that can be fairly productive. The Apacer DDR4 SO-DIMM gaming memory module, as known as NOX DDR4 SODIMM, performs at up to 3000MHz clock-rates with up to 64GB capacity (16GB x 4). Now with NOX as a part of CLEVO P870DM3-G gaming laptop at your disposal, we can guarantee you that there will not be anything like NOX for quite some time, because it will cope with the next-generation gaming and extremely intensive applications. Apacer NOX DDR4 SO-DIMM was first introduced a year ago, and the premium specifications have remained at an unchallenged position to date, which is considered a rarity in the industry. CLEVO, a renowned company specializing in gaming laptops, currently owns some of the most famous models that are well applauded for. The latest one, the high-end CLEVO P870DM3-G, is equipped with the best components that the market can offer, including its CPU, GPU, screen and many more. For the very vital key to performances, the memory module, CLEVO adopts Apacer NOX DDR4 SO-DIMM to bring users unmatched performances. This state-of-the-art laptop has already been launched under the elite gaming laptop maker Schenker as XMG U727 and was immediately given very high recognition by Notebook Check.net, a famous website with strong credibility, for its ability to cope with complicated gaming operations. Apacer’s advancement in memory development speaks for itself. 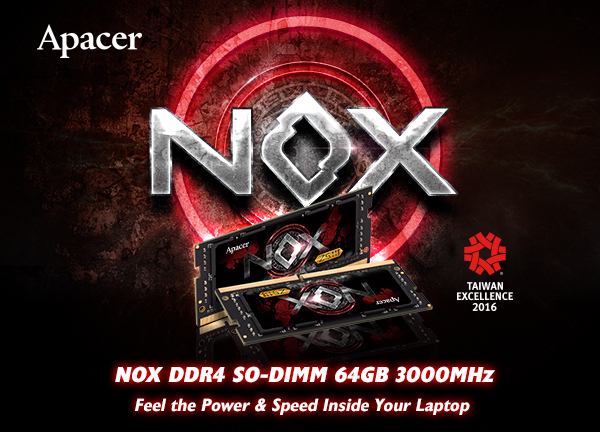 NOX DDR4 is the first SO-DIMM equipped with topmost standards in the industry. Having been launched a year ago and now a winner of 2016 Taiwan Excellence Award, NOX is still the most phenomenal memory by far. Considering the fast-changing nature and the competitiveness of the industry, this is definitely a rare phenomenon. Keeping stability under extreme operations is the core of Apacer standard. NOX DDR4’s 64GB memory kits come with performance options of 2400 MHz, 2666 MHz, 2800MHz, and 3000MHz. 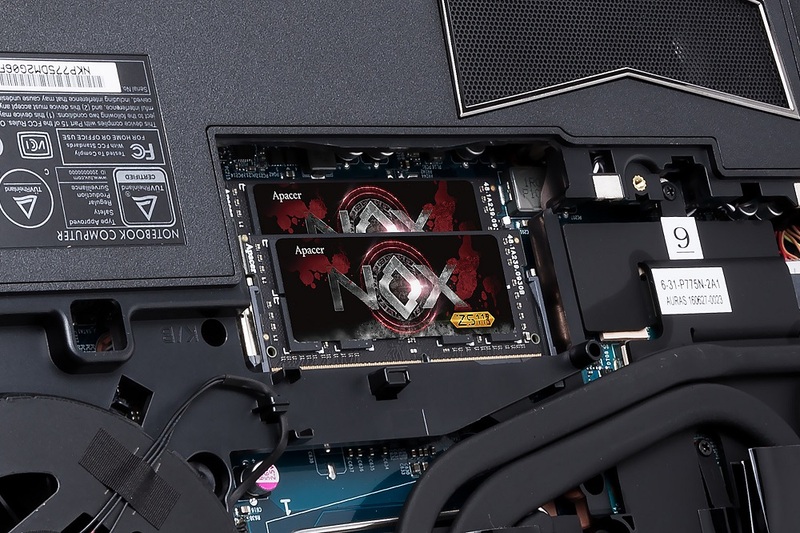 To ensure gamers maintain their best status at all times, NOX is built to withstand 120°C heat while running at full throttle in the narrow environment inside a laptop. This also gives the laptop a 35% capacity improvement. 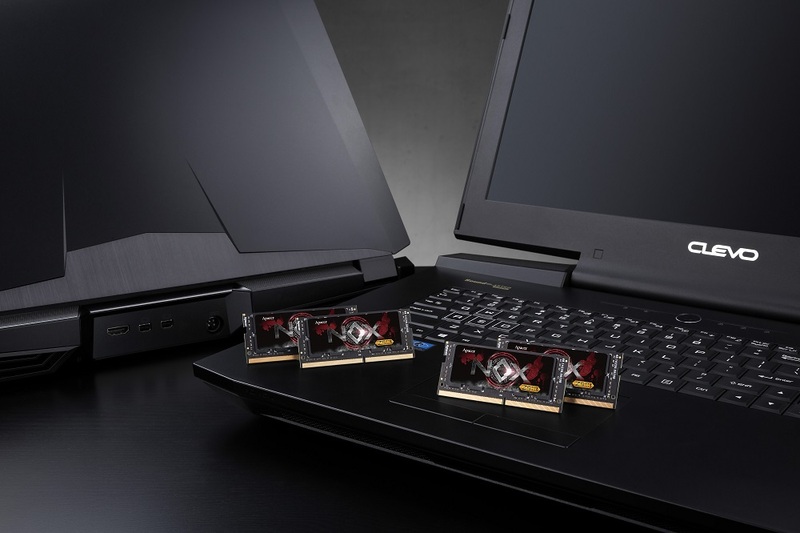 CLEVO is very confident in the glorious performance of Apacer NOX DDR4 SO-DIMM, describing it as a “leading edge product for gaming laptops, in terms of both performance and technical advancement”. This crossover by the two leading brands is unlikely to see anyone surpassing, at least not in the near future.